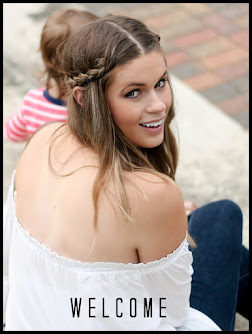 If you have been with me for a little while you know I frequently mention my efforts to get back to pre-baby weight. I've been sitting steady around 20 lbs heavier than my usual number and have been making little baby strides every few months. I have no problem eating healthy and working out regularly, for small chunks of time. HA! But, it does take a lot of trial and error for me to find a happy and healthy place that I can maintain for more than a couple months. I've mentioned before some of my favorite tools for losing the weight. You can find those here. But my overall , best tip for food & sugar lovers like myself is to find healthy snacks that you love and then get really acquainted with them. What I mean by that, is check out the ingredients. If you're counting calories or points make a mental log of their value. So that way you will always have trusty standby snacks that can fight off cravings and seamlessly fit into your daily plan. For me, one of those items is Zevia. Which is why I agreed to partner with them on this post. AND they are going to give a six pack away to some of my Instagram followers so you can try it out for yourself!! As you can probably read on the can each of their drinks have zero calories and zero sugar! Which is absolutely perfect if your trying to manage your daily diet. But, that's not the only great thing about Zevia... They're naturally sweetened with Stevia, Vegan, Certified gluten free and NON-GMO. But what's my favorite thing about them... They're clear! There are absolutely no colors added to the drink. Which is a literal gift to a woman with two toddlers and white furniture. Trust me on this. 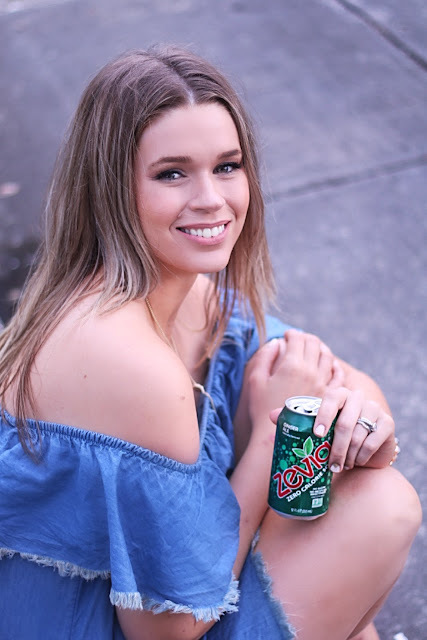 To find out more about Zevia and their various flavors and where you can grab some for yourself head here! Now, for the real meat of this post. What do I eat during the day when I'm trying to stay on track and count calories... I have a set goal for my daily calories that is designed to help me gradually and safely lose weight. And to reach that goal, I typically try to keep Breakfast & Lunch around 300 Calories, My snacks around 100 and Dinner around 400-500. And when I work out I take that into consideration and give my diet a little more play room. 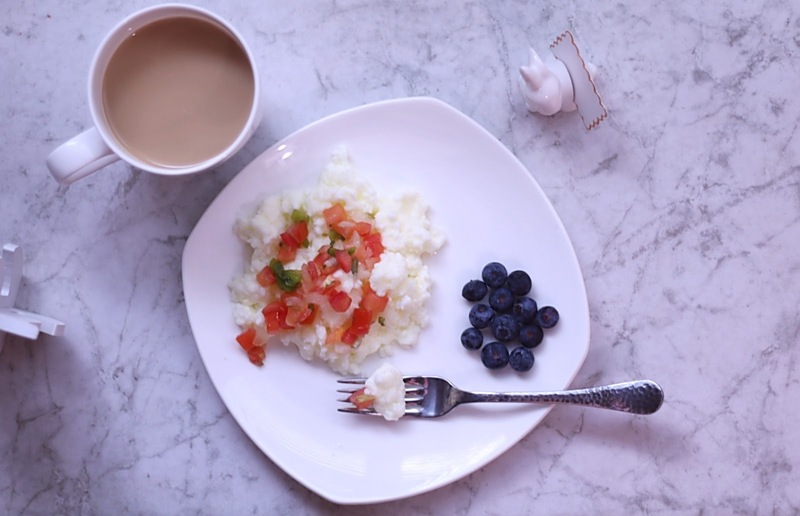 For Breakfast I love egg whites with pico de gallo, some fresh fruit and a Skinny (sugar free) Vanilla Latte. The protein in the eggs help me stay fuller longer and the fruit and coffee satisfy my sweet tooth. Usually after I'm a couple of hours into my work day I stop for a quick snack which is typically a handful of low fat cheese and some dried fruit, with nuts or chocolate. 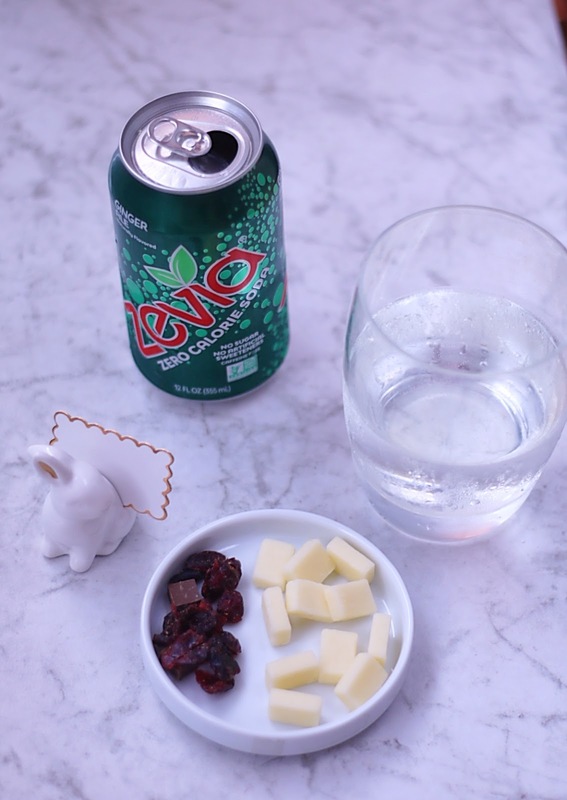 I love this Zevia Ginger Ale for a little sweetness with my morning snack. And typically for my post lunch snack I'll go for one of Zevia's caffeinated colas! They're great for a little afternoon pep! 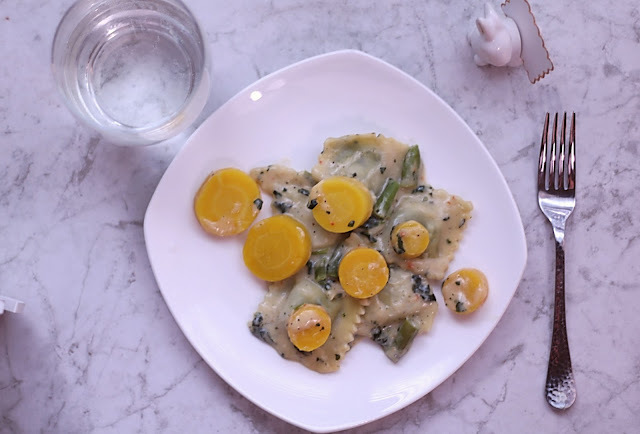 For lunch I often eat a pre packaged meal from the grocery store that is low calorie and can be cooked in the microwave quickly, as my lunch breaks are pretty short. I do my best to go with brands that use natural ingredients. Dinner looks different everyday, but I've found that sticking with portion control gives you a lot of freedom in your meal choices. Some of our go to's are lean turkey tacos, Grilled Chicken with Couscous or Pork Loin with Vegetables. If I do good with all of this and work out, I usually have a little room left over for a small glass of wine or a sweet treat once the kids have gone to bed. While reading it back, it doesn't seem like much. But if you drink lots of water it will help you feel full. And making sure to eat every three hours makes the time go by quickly so you never feel like you're starving. I hope you found this helpful and I would love to hear some of your tips for staying on track each day! Let me know in the comments below! And don't forget to check out Zevia here! Haha Yes! I feel you. I have the hardest time staying on track. I feel like I'm constantly doing the two steps forward, one step back thing. "You'll also want to make sure you're working towards an attainable goal that's tailored for your body." YES. So many people work toward things that just aren't healthy for their body, so I appreciate you saying this. I'll have to give this ginger ale a try! Staying on track is the hardest thing for me! Right now I am trying to get back to how I was before I got pregnant 🤰! Let me remind you my son is 4 years old now and I'm still not there yet! I love the Zevia grape- so yummy! It looks like a good eating plan...although I steer clear of dried fruit, it is usually full of sugar. Wow I never heard of this drink but we would love that! I eat a similar breakfast to you! You are so pretty! I have never heard of Zevia - I'll have to try it! Stevia is such an awesome sweetener! I haven't heard of this drink before, but now I'll have to look for it! I am trying to get back on track with healthy eating! Portion control is a huge one! I haven't heard of this drink before but I love Ginger Ale as a treat so I will def have to check it out! My eating has been all over the place since the birth of my son. I'm hungry all of the time (nursing) but I know I need to cut back on the treats and replace them with more healthy fats/whole grains. 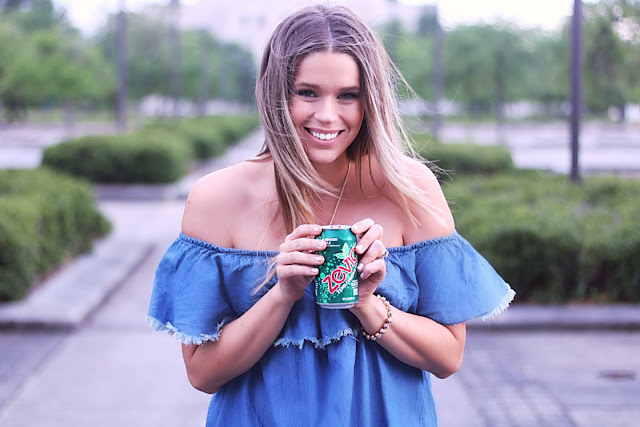 I've never tried that beverage but love anything that has no sugar in it! This looks like something I could enjoy outdoors on one of my hikes. 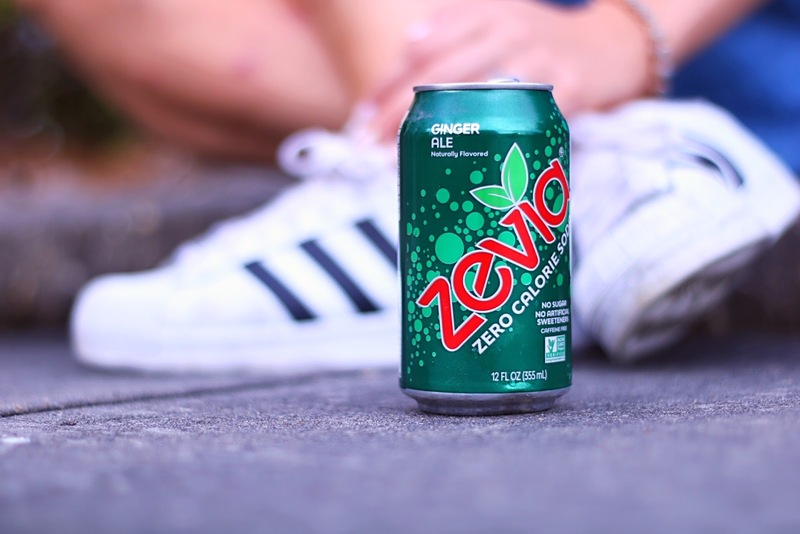 I'm not a huge fan of sodas, but I have some friends who swear by Zevia- they LOVE it. I am definitely giving it a try the next time I'm craving something bubbly. I need to track my eating.. maybe start a diary to help stay on track. Im not sure i have seen this in the grocery but i will be looking for it! I've seen this in the store but had no idea what it was or how it would taste haha! Ill have to try it now! I haven't heard of this but will definitely try it. I love all your tips and do something similar except I usually try to make dinner so that there are enough leftovers for lunch.